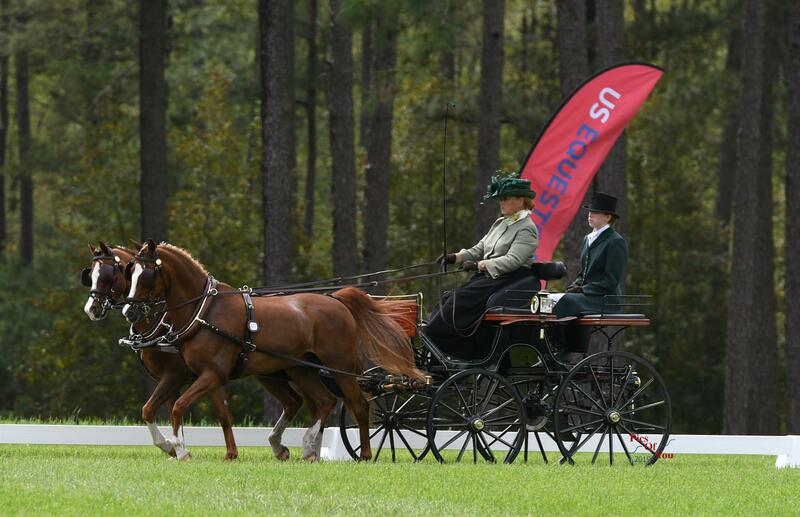 Raeford, N.C. – The USEF Advanced Pony Combined Driving National Championships concluded on Sunday with the cones phase at the Southern Pines Combined Driving Event (CDE). Two new national champions were crowned after strong performances against stiff competition. The marathon phase proved to be challenging due to wet conditions and warm weather, but Keeler and her nine-year-old Dutch Harness cross mare aimed for a steady performance. “We thought it was a pretty solid round; we didn’t make any mistakes, and [Amazing Grace] just kept moving … to win every single obstacle was an incredible feeling.” Keeler said. “She just kept going, she just rose to occasion. She has an incredible amount of heart and she really showed it.” Keeler also thanked her navigator, David Harris, for the marathon win. The cones course was difficult, but Keeler and Amazing Grace delivered a double-clear round. “I went in there and let her do her thing,” Keeler said. “She was so solid, she never looked at anything, and she just did her job.” The pair won on a score of 127.50, and Keeler dedicated the win to her mom, who celebrated her 86th birthday on Sunday. Leslie Berndl (Lexington, Ky.) and Sweetwater’s Zorah Belle, Teressa Kandianis’s 15-year-old Norwegian Fjord mare, earned the reserve champion title by closing out their weekend with a double-clear cones round to finish on a total score of 138.78 penalty points. Rebecca Gutierrez (Windsor, S.C.) and Naria BW 6, Mary-Anne Mitchell’s 16-year-old Haflinger mare, collected 13.55 penalty points in the cones phase to finish in third place on a total score of 152.39 penalty points. 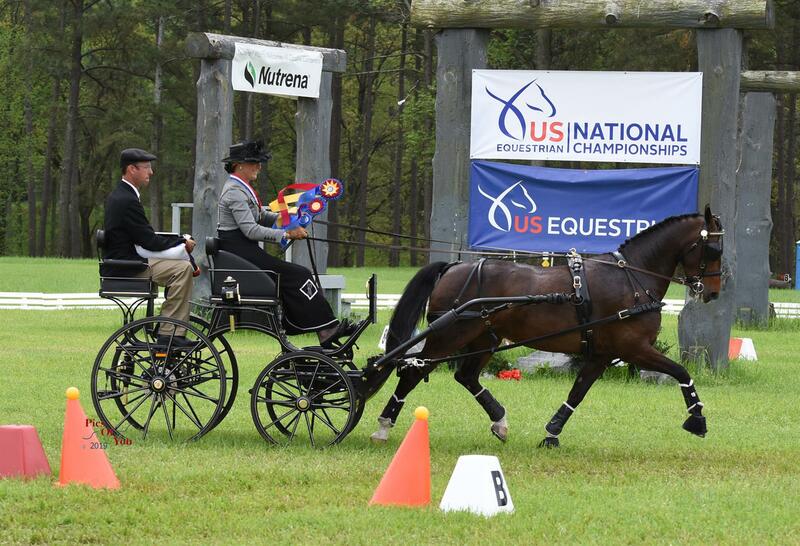 Katie Whaley (Paris, Ky.) added another national championship title to her resume thanks to her team of Tommy, a 16-year-old Welsh cross gelding; Tanner, a 13-year-old Welsh cross gelding; and Teddy, a six-year-old Welsh Pony gelding. Whaley’s ponies are a mix of two veterans and a youngster, but they all delivered throughout the weekend. Whaley chose her veteran pair of Tommy and Tanner again for the cones phase. “The cones phase was good. I had two balls down, which was my fault, but they felt great.” Whaley won on a score of 146.57 penalty points after collecting 6.00 penalty points in the final phase. Keady Cadwell (Southern Pines, N.C.) partnered with Dragon's Lair Aethelfrith, Deborah Branson’s 11-year-old Half-Welsh mare, and Hidden Springs Bosa Nova, Branson’s 12-year-old Welsh Pony cross gelding, to claim the reserve champion title. Cadwell and the ponies tallied 6.25 penalty points in the cones phase to finish on a total score of 164.64 penalty points. Mary Phelps (Columbia, Ky.) finished third with her team of Al Capony, a nine-year-old American Shetland Pony gelding; Bugsy Malony, a 12-year-old American Shetland Pony gelding; and Tony da Pony, a six-year-old Welsh Pony cross gelding. Phelps collected 8.70 penalty points in the cones phase to end on a total score of 167.20 penalty points. View results for the Southern Pines CDE. Stay up to date on USA Driving by following along on Facebook and US Equestrian on Instagram and Twitter. Use #USADriving.